Between Aaron Kromer taking his criticisms of Jay Cutler outside of Halas Hall and players like Brandon Marshall and Martellus Bennett reportedly creating tension in the locker room, it didn’t seem like the 2014 season could get any weirder for the Chicago Bears, but on Wednesday we were all proven wrong as Cutler was benched by head coach Marc Trestman. Only, we didn’t find out that Cutler had been benched directly from the head coach. He had an entire press conference scheduled that afternoon, and didn’t mention that benching Cutler was even an option, much less a course of action. Instead, we had to find out the same way that we found out that there was dissention in the team’s front office: via anonymous sources. This evening, it was ESPN’s Adam Schefter that reported the news, and Chris Mortensen quickly followed and said that Cutler was told by Trestman that he would be sitting on the bench for Sunday’s game earlier in the day. Trestman allowing the media to bring this news to light instead of taking the reins and doing it himself is yet another example of just how dysfunctional this Bears team is. It was a cowardly move by a coach who has pretty clearly given up hope that he is going to be employed by the Bears in 2015, and if this is the way he’s going to choose to conduct his business, then there’s good reason for that fact of life. In addition to being cowardly, the decision doesn’t make much sense on a strategic level. 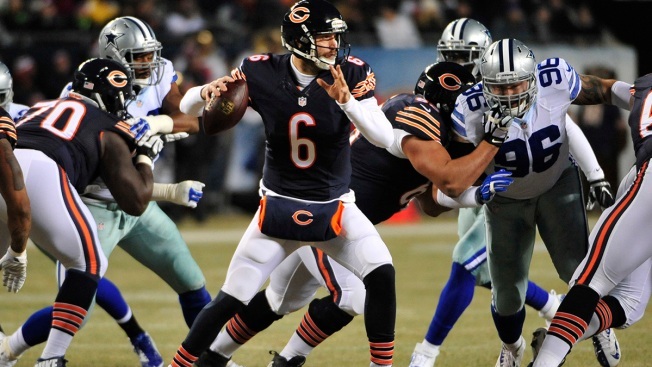 Sure Cutler looked awful against the New Orleans Saints on Monday, but why make this move now? There are two games left in the season. If Jimmy Clausen was going to be the guy that would lead this team to a better chance to win, why wasn’t he called in after the Miami game? Or the New England game? If this move isn’t about winning and is more about protecting Cutler as a potential trade asset, then why start Clausen over David Fales? The team signed Fales to its roster to protect him from teams that were inquiring about signing him off the Bears’ practice squad, so why not run him out there against a team with playoff aspirations and see how he does against some real competition? The weakness that this move projects will also diminish any possible return that the Bears could get for Cutler if they choose to trade him in the offseason (and why would Cutler want to come back to a team that’s treated him in this way?). Why should a team cough up precious draft picks to help bail the Bears out of a mess that they clearly don’t want to be embroiled in? This desperate move, whatever the motivation, weakens whatever leverage the Bears have, and should make trying to trade him an almost impossible endeavor. This story, more than any other, is the story of the 2014 Bears in a nutshell.